A Japanese adventure game of the visual novel sub-genre. Players have the opportunity to play the role of a young high school student and a beginner mechanic, whose dream is to build a real mecha several meters long. Robotics;Notes is a visual novel adventure game. The game was developed by 5pb. and Nitroplus. Both developers are well known to fans of visual novel and the Japanese pop culture, especially the part of it that is connected with the so-called otaku culture (obsessive fans of manga, anime, militaria or sc-fi films). The developers have made many console titles, of which only a small percentage was released in the West. Robotics;Notes is the third game, after Chaos;Head published in 2008 and Steins;Gate from 2010, which is part the series of sc-fi adventures with the characteristic semicolon in the title. All the games in the series are loosely linked to each other and take place in modern Japan. Their plot focuses on themes related to technological progress and scientific experiments, as well as using ideas derived from urban legends and conspiracy theories. Robotics;Notes takes place in the southern part of Japan in 2019. The main character is Kaito Yashio, a high school student belonging to a small robotics club. Kaito is also a big fan of online fighting games. When one day he learns that one of his schoolmates has programmed a combat system and engine in his favourite game, he decides to use her knowledge and experience to build a mech. 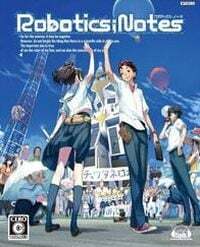 Robotics;Notes is a typical Japanese visual novel, which means that for most of the game we read and listen to character dialogues, usually without having much influence on them. However, at the most important moments, we must make decisions leading to one of the many endings. Unlike the previous games in the series, the developers introduced more interactive elements into the game. The main character does not part with his tablet - players can use the item in several ways. When you are not busy chatting with other characters, you can run some useful applications. One of them uses the possibilities of augmented reality and after bringing it closer to some objects, e.g. buildings in the background, we can get a short description of them. What is interesting, thanks to the program it is also possible to change the outfits of the characters watched through the tablet's camera. In addition, we can also use a Twitter-like service to contact other characters. It is worth mentioning that the title also contains comprehensive descriptions of all terms and characters appearing in the game. A big novelty in Robotics;Notes is the fact that standard two-dimensional and static portraits of characters have been replaced by three-dimensional models. This makes interactions with other heroes more interesting. Their animations allow them to express emotions and moods. In addition, thanks to the synchronization of lip movement with recorded voices, you can have the impression that you are watching an anime series. The backgrounds and scenography, however, have been made using typical, for this genre, methods - the backgrounds are two-dimensional graphics.